Fuerth says that in December the farm had Muslim customers ordering Halal lamb for the Feast of Eid. Then Orthodox Christians celebrated the Feast of St. Nicholas. And twelve days after Christmas there is Little Christmas also celebrated by those of the Orthodox faith. Throughout the year there are various saints’ days, which many cultures celebrate with a feast which includes the serving of lamb. Ewe Dell has been in business since the early 1970s and has grown with the county’s population. Carol says the name is obvious enough. A ewe is a female sheep and the word dell comes from the folk song and nursery rhyme Farmer in the Dell. The name also reflects the fact “we’re in kind a bit of a wooded glen,” she says. It is the only farm of its kind in Essex County and attracts customers from as far as Chatham and Michigan. The farm offers a variety of products from roasts to chops and sausage. In recent years it has been selling many traditional by-products such as intestines and blood, which are savoured by different ethnic populations. The gauzy webbing around the fat is also bought by certain customers to keep the meat moist when cooking “because lamb is not marbled like beef,” Carol says. The farm added a provincially-inspected slaughterhouse in 1993. It sells to individual customers as well as to stores and restaurants. Husband Rick says the family has another business that constructs farm buildings. 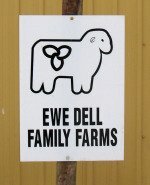 It’s known as Ewe Dell Enterprises. The business, open to drop-in customers on weekends, is located at 1282 Concession 2 in Lakeshore (519-723-4456).